Is CPU Tctl value is still a Tdie value on Ryzen? Hi Martin! Appreciate your work on the project! I would like to clarify your post https://www.hwinfo.com/forum/Thread-Ryze...6#pid13856 where you say that CPU Tctl is basically a Tdie for Ryzens. Is it still the case? For 2700 series too? As i have one and this specific value bothers me at 80 degress during low-to-medium workloads. Should we still subtract 20 degrees from that value? That depends on particular model and Tctl=Tdie only if the CPU doesn't use an offset (Tctl_offset). If you see in sensors a "CPU (Tctl/Tdie)" value, it means they are same. Otherwise there will be 2 values shown Tctl and Tdie. (05-25-2018, 11:48 AM)Martin Wrote: That depends on particular model and Tctl=Tdie only if the CPU doesn't use an offset (Tctl_offset). My cpu is 2700x, motherboard msi x470 m7. In HWINFo (latest release) there indeed two separate values for Tctl/Tdie. I also havn't touched any settings/options in it. In BIOS cpu vcore set to 1.325 and cpu multi to 41. LLC level 1 shows in HWINFO that those voltages stay the same under load. It just feels strange to have 80+ Tctl reading at 1.325 during light workload (about 30% on all cores). You see Tctl and also Tdie and they show same values? That's strange, can you please attach the HWiNFO Debug File ? (05-25-2018, 12:22 PM)Martin Wrote: You see Tctl and also Tdie and they show same values? That's strange, can you please attach the HWiNFO Debug File ? 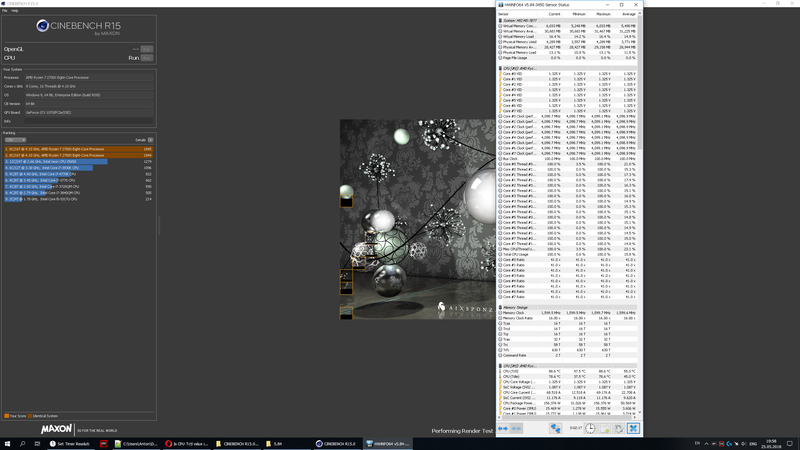 In the past i used program called realtemp, manually set Tdie there according to 4690k specifications and it was showing 64-66 degrees under load. But here with this new ryzen 2700x i'm a bit uncomfortable with one of the sensors (which you say is the most important one on zen chips) beeing 88 degrees. I see a 10C difference between Tctl and Tdie , which is correct for 2700X. So your real temperature is 78 C on the screenshot (Tdie). Ryzen 2xxx series are just hotter and require better cooling. Hello guys, new here, not new to computers though. I can only chip in some info on a Ryzen 5 1600X (on an Asus Prime B350M-A), and a dual Epyc 7351 (on a Supermicro H11DSU-iN) , both running Fedora 28 (kernel 4.20 on the Ryzen, and 4.18 on the Epyc). Interesting that difference in Tctl vs. Tdie on the Ryzen. Also one thing, I lowered the Ryzen's temp by 20C !!! just by installing an atermarket large air cooler. The difference between Tctl vs. Tdie depends on presence of a fixed Tctl_offset, which is specific for each CPU model. Some CPUs have that offset (then Tdie = Tctl - Tctl_offset), some don't (Tdie = Tctl). HWiNFO uses an universal method to determine Tctl_offset, it doesn't have values hard-coded for each model. Current time: 04-20-2019, 10:01 PM Powered By MyBB, © 2002-2019 MyBB Group.